For those of you out there who know me, you know I have an uncanny ability to spot things. Like the other day for instance. London plays host to numerous fairs, trade shows and exhibitions. Many years ago I began making a point of attending them for the pleasure of seeing what was out there. Lo and behold I came and continue to come across a myriad of products that sometimes never make it to the High Street. Beautiful jewel tones which can be worn separately or together. 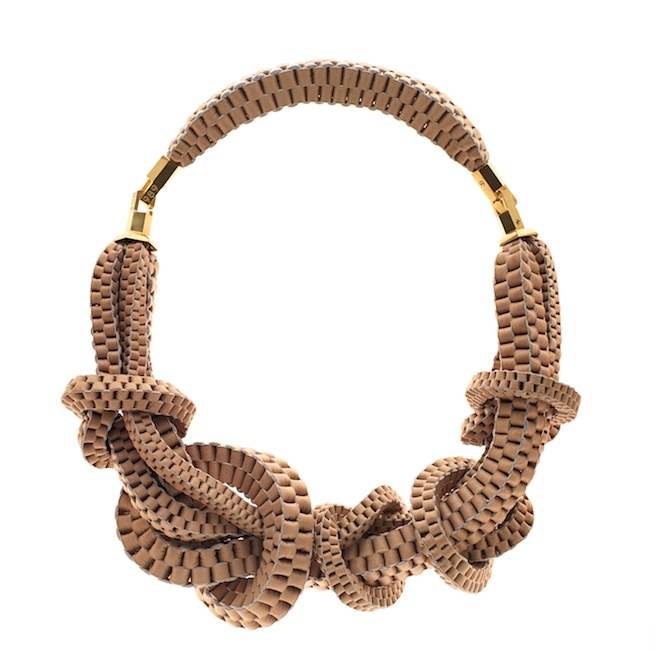 Dagmar Kestner is an extremely talented fashion and accessory designer. The essence of her collection is to cultivate and revive traditional handcrafted techniques, using leather in unexpected ways. 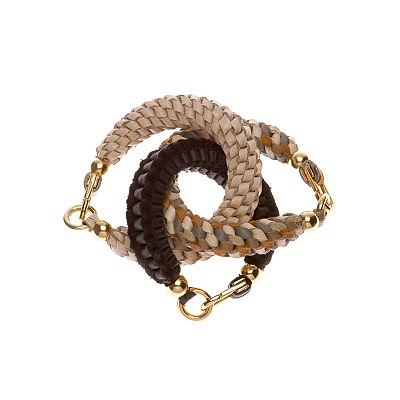 If Hermès were to introduce woven leather accessories they would almost certainly resemble some of Dagmar’s pieces. Think of macramé taken to a sophisticated and modern level. The playful items can be worn in various ways, joined or disassembled and new colours can be collected or combined throughout the seasons. When ordering an item from the collection you are offered a choice of hardware finish; gun metal or a high quality gold-plated brass. 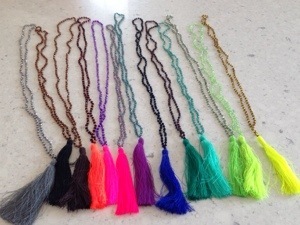 The necklaces and bracelets are available in 12 colours which can be mixed and matched. Prices range from £95-£445. Contact Dagmar on +45 52520443 if you are interested in ordering one of the items from her collection info@dagmarkestner.com or click here to view the collection in its entirety. 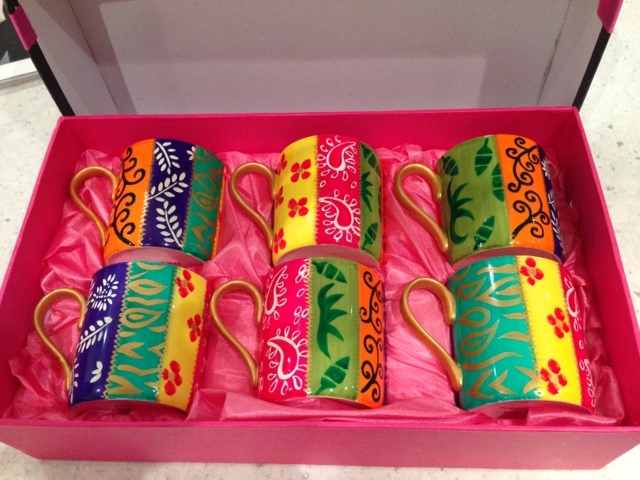 Last but certainly not least is the whimsical hand painted bone china by Caroline Hely Hutchinson for CHH Design. 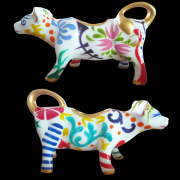 Many of her designs are inspired by the vivid colours of the countryside and the Côte d’Azur. The technique of firing the china at low temperatures allow it to retain its vibrancy. for first course, cheese, dessert or even breakfast. They come in a lovely gift box as do all items. In addition to the plates, I quite liked the set of six mugs. There are so many items to choose from. 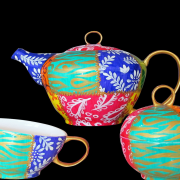 Jugs, teapots, sugar and creamers, bowls, coffee pots. Whatever occasion requires a gift, this might be your solution. Who would have thought that china could put a smile on your face! If you are interested in purchasing any one of the items featured on the CHH website click here. 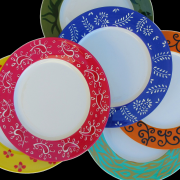 Were the dinner plates pretty? Dinner plate size? great little necklaces, light and doesn’t take any space in suitcases!